In today's modern world we are constantly bombarded by media's tales of war. With the current war in Iraq quite often these reports detail an insurgent bombing, civilian casualties or some other "atrocity of war". In many ways it seems that a key element of this armed conflict has been forgotten. On all sides of the fight, there are men and women, human beings, trying to make the best of a messy situation. 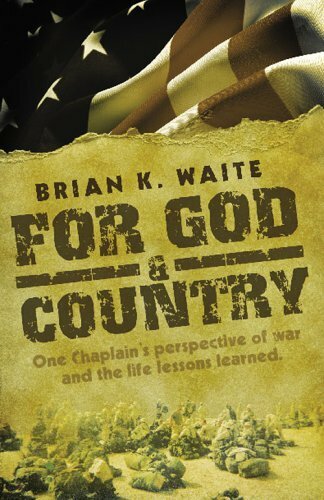 Chaplain Brian K. Waite's work, "For God and Country: One Chaplain's Perspective of War and the Life Lessons Learned", reminds us that this conflict is in fact being fought by human beings. In stark contrast to most mainstream media coverage and written coverage of the war, Chaplain Waite, recounts his story and the story of his Marines through the timeline of his ministry amongst them from deployment, to the battle of An Nasiriyah, back to the home front. Much has been made about how highly trained and dominating the United States military forces, in particular the Marines, have been in combat aided by superior training and modern technology. Chaplain Waite's work fills a curious void in coverage to date. Chaplain Waite reminds us that despite the superior tactics, equipment and training that signify the young men and women that compose our armed forces, God and faith in Him, as well as one's country, are two commonly overlooked battlefield influences that are key components of our armed forces. This work also serves notice that Chaplains in wartime are not merely present to have mass and preside over funerals. In the US armed forces Chaplains are revered members of the service, cherished by their units and commands alike. The mere presence of a chaplain can be provide a substantial boost, just when its needed, on the front lines. While chaplains are non-combatants, in all other ways they are soldiers, or in this case a Marine, their families also sacrifice the home front influence of father's and husbands, and chaplains shed their own blood on the field of battle in an effort to minister to their men. Their battlefield influence as well sacrifices are just as potent as an armed Marine, the results are just not as plain to see. Chaplain Waite did not write this book to preach that God is giving our troops and advantage against a heathen enemy, or that there is some divine justification for the current war. Quite on the contrary, this work strives to show the reader, through vivid first person accounts, that faith in God can allow an individual or group of individuals, to make the best of a messy, seemingly impossible situation. “For God and Country” is truly a portrait of the spirit of the American soldier. From the most hardened combat veteran, to the greenest recruit, whether the individual is religious, or chooses not to believe, this work reveals the transcendent nature or God on the battlefield and the benefits even the contemplation of His existence can provide a fighting force in a dire time. “For God and Country” is truly an uplifting book that shines a bright light on an often overlooked aspect of modern military conflict. This book is a must read for anyone interested in seeing another take on the war in Iraq. Thank you for your kind and gracious review. I would just like to remind all of our readers that all of the author's proceeds will be going to the Intrepid Foundation's Fallen Heros Fund to aid the orphans and widows of OIF and OEF. My computer crashed about a month ago. Please email me so I can get your email address back in my address book.